To prepare a master budget, managerial accountants collaborate with managers throughout the organization to develop a realistic plan, in numbers, for what will happen during the next period. The master budget counts on your understanding of cost behavior, the results of capital budgeting, pricing, and other managerial accounting information in order to plan a concrete strategy to meet sales, profit, and cash-flow goals for the coming year. Budgeting can get frustrating because decision-makers throughout the organization need to agree to a single plan, the master budget. Not only that, but the master budget they agree to must actually work; it must result in sustainable cash flows and meet the company’s profitability goals. Suppose Frank in the Sales department expects to sell 1,000 widgets for $20 each. Fran says that the Production department can produce a maximum of 900 widgets, costing $21 each. Sally in Cash Management says the company has $500 in cash. Combining all this information results in a train wreck. First of all, even though the Sales department projects selling 1,000 units, it can only sell as many units as the production department makes: 900 units. Therefore the company will probably not meet customer demand. Next, the sales price is too low. 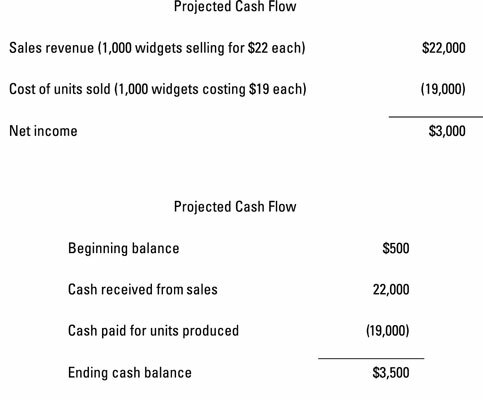 Because the company spends $21 to make each widget but only sells each one for $20, it loses $1 on every widget, resulting in a projected net loss of $900. Making matters worse, the company doesn’t have enough cash. It has $500 in the bank at the beginning of the year, which will probably turn into a $400 overdraft by the end of the year. In short, the company doesn’t produce enough goods to sell, it sets the sales price too low, its production costs are too high, and it has insufficient cash flow. Managers and managerial accountants need to work together to develop a budget that works. Suppose that, after some negotiation, the Sales department finds a way to raise its price to $22 per widget. The Production department realizes that it can produce 1,000 units if employees reconfigure their equipment. This equipment change also reduces the cost per unit to $19. Figure 1-2 shows what can happen under these new circumstances. As a result of close coordination (and perhaps a little arm twisting), the company now projects to fully meet customer demand for 1,000 units. 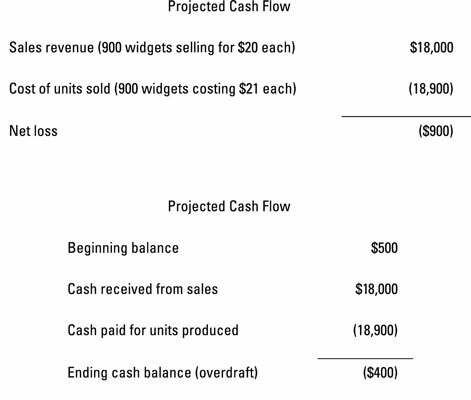 In doing so, it expects (positive) net income of $3,000 and an ending cash balance of $3,500. What would have happened if management took the departments’ plans at face value without preparing a budget? It would have manufactured too few units at too high a cost and sold them at too low a price, incurring a loss. The budgetary process helps avoid this mess; it’s a critical step to help a company meet its goals.